Internet connections being what they are, I can’t post more than a few pictures for now. Not that I’m too surprised that broadband has yet to reach this crumpled nook of the country. 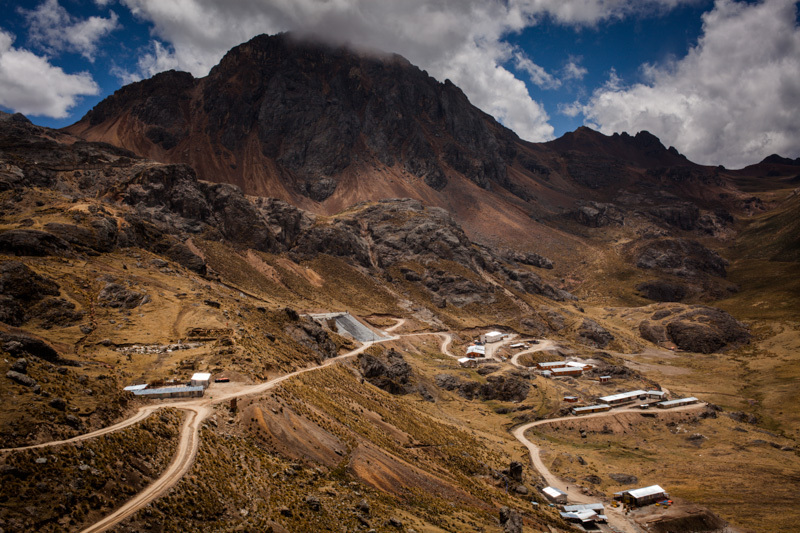 A dusty and windswept mining town, Oyon clings to the steep-sided slopes in what feels like the very guts of the Peruvian Andes. 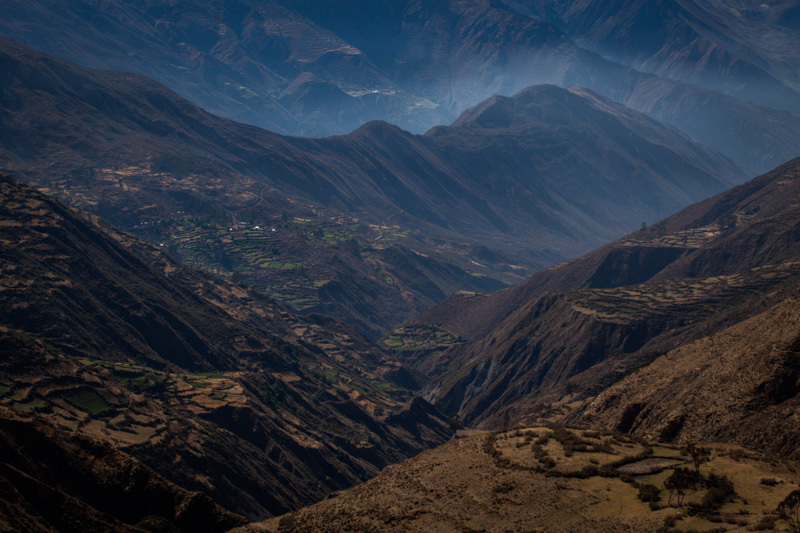 All around lies improbably rugged terrain: one folded, buckled range after another, bridged with valleys once roughly scoured by glaciers, and now tinged with minerals that have gold diggers ringing their hands with glee. It’s been relentless, yoyo-ing up and down the mountains, as much as two thousand metres at a time. Despite the arrival of the raining season and its afternoon deluges, our spirits have yet to be dampened. In fact, it’s been quite the opposite. These last few days have served to fuel further my love for the country and its dirt road touring potential. 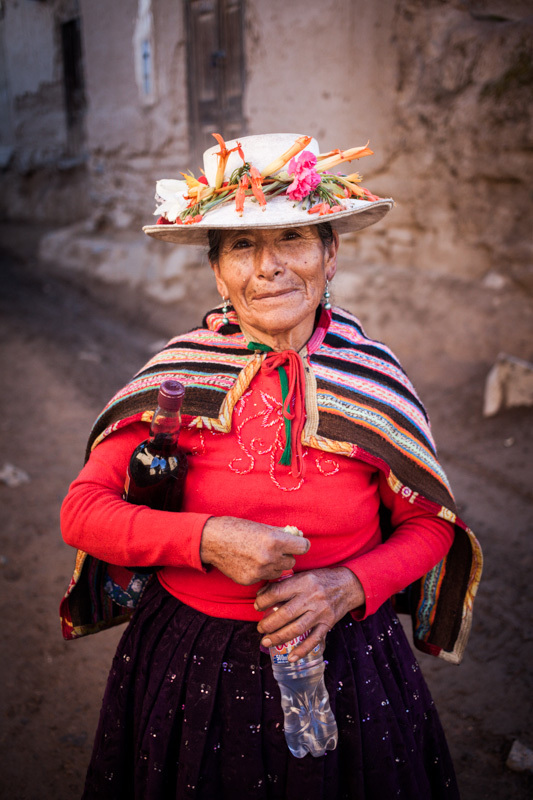 Ticlios, Llaclla, Mangas… a string of beautiful, welcoming, remote and high elevation villages linked by merest scraps of road and footpaths, painstakingly chiselled into the sheerest and most stark of mountain sides. 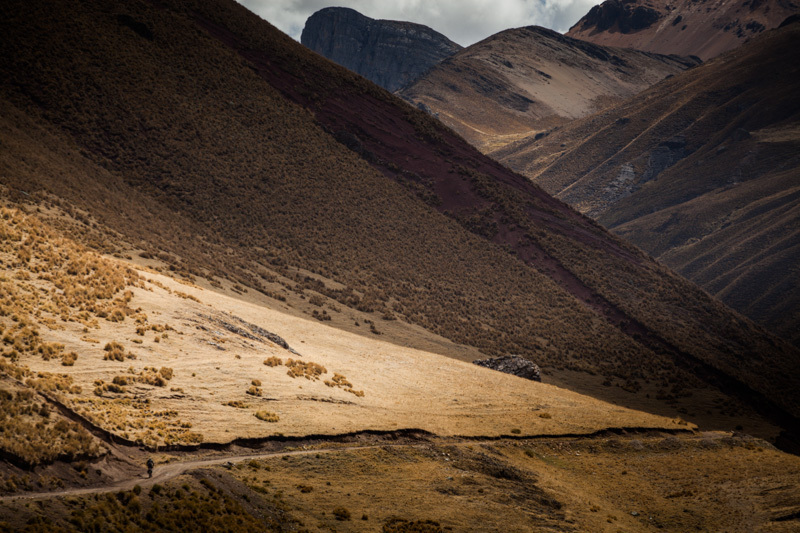 The road to Ticclios, burrowing deep into the guts of the Peruvian Andes. The descent down to Oyon. 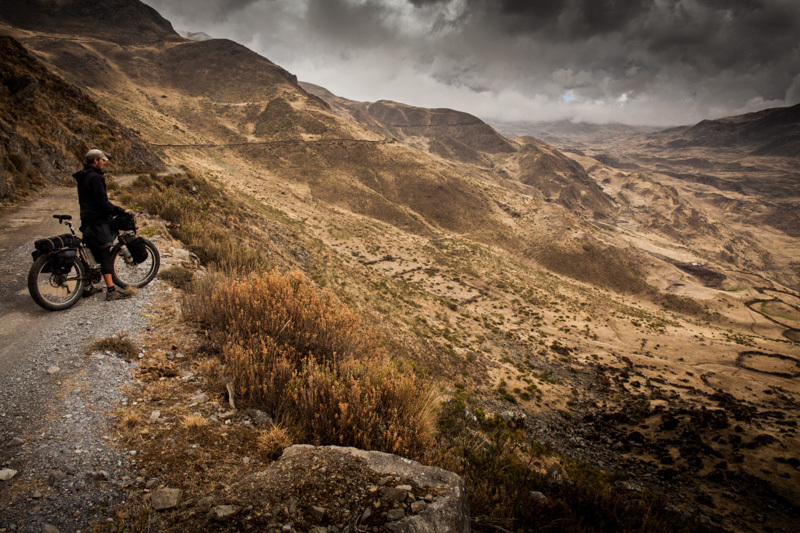 Kurt contemplates ‘El Silencio’, the empty, oh-so-quiet highlands of Peru. View from the tent, 4500m. Bike, grease and coffee. This would be the coffee. 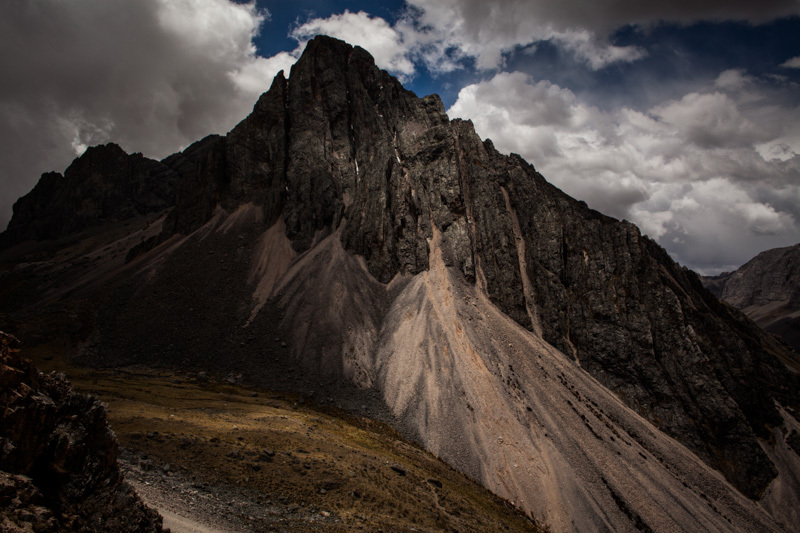 The blight of Chanca Mina, en route to a 4850m pass: the highest of the trip so far. Mangas main square, reached after a 500m hike n’ bike, followed by a 1000m climb. Friendly folks too. The women round here wear fresh garlands of flowers in their sombreros. What goes up, must go down. And lastly… Always hungrily gulped down. 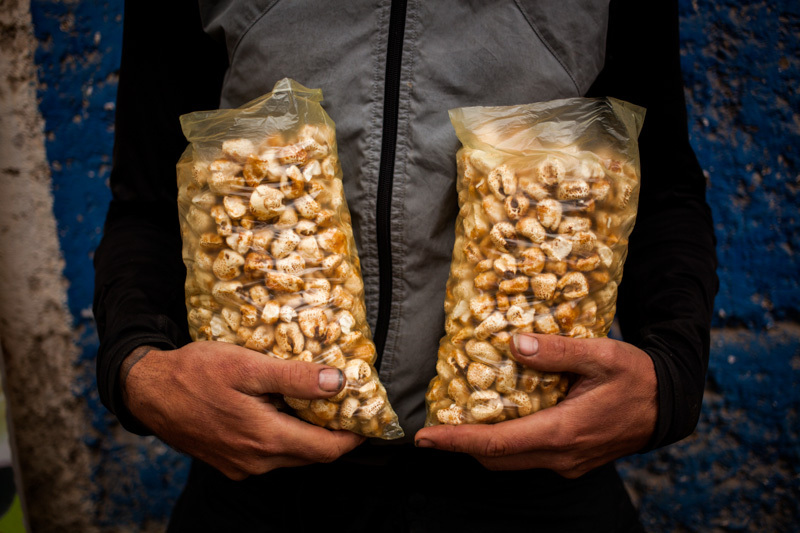 These tasty treats – oversized puffed wheat coated in sugar – have become our go-to, high mountain snacks. There’s no internet in Cajatambo, but there is in Oyon. Fight with the kids to get a seat in a cramped booth. As well as doubles with bathrooms, El Minero (by the football pitch) has more basic rooms – 25 Sol for 2. It also has the perk that you can use its reasonable wifi – the only place in town, from what we could see. Man, it does look heavenly! Gorgeous photos. If only I could talk my wife into those tortuous steeps. That may have to be a me trip. On a side note, how are you liking the Smart Sams? We are leaving for Africa on 12/6 and I am still trying to nail down tires for an on and off road journey. I read somewhere that they do a fairly good job on tarmac as well as in the dirt. Re the Smart Sams… I’m pretty happy with them, though they’re a little thin and prone to thorn punctures. They do roll really nicely on pavement, and they’re cheap. Geax Saguaros (in a shapely 2.3) also come highly recommended for speed and durability from friends. I might try those next time. Second and sixth picture .. ! There’s a Plus version of the Smart Sam that’s has an extra 3 mm anti flat rubber strip. Adds about 300g, less than 10$ more but only wire bead and 2.1 width (for the 29er version). Now that we’re out of thorn country, I’m happy with the standard Smart Sams. Fully loaded, I’ve been running them at 40 psi, and they’ve felt good on both road and trail (25-30 psi when on bumpy climbs). If anything, I’d like them fatter! Beautiful trip by bike, Cajatambo is so beautiful… So, What camera do you use? reflex? Your photos are amazing or as they say in the USA ‘AWESOME’… I especially love the one with the hands holding the puffed wheat… against the blue painted bricks back drop. Perfect. Thank YOU for sharing… so glad you’re better. View from tent and old woman are AWEmazing! Hi Cass, you’re really in love to Peru..a very nice place. Great photos! Nice to see you back on the road. 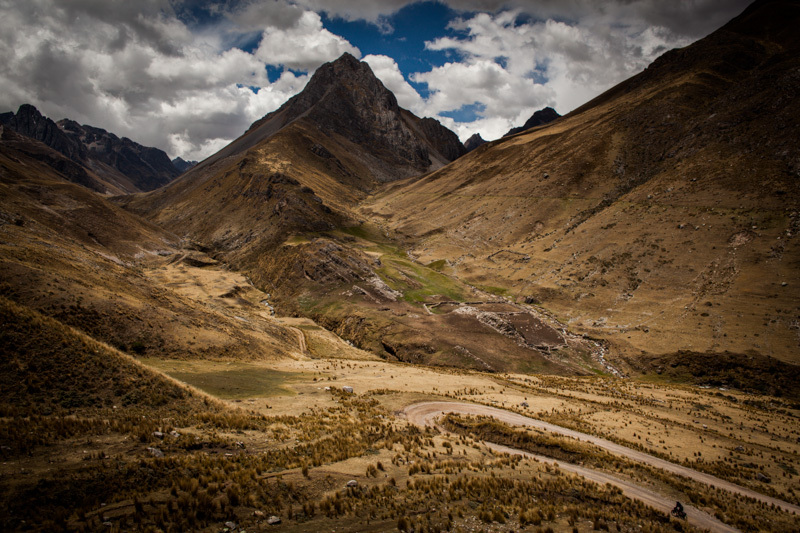 Inspiring pics of the Andes peruanos… stay away from rivers! Compadre – let’s ride some time! These are unreal. More, more! Pleased to hear you’ve recovered and that the rainy season isn’t getting in the way. 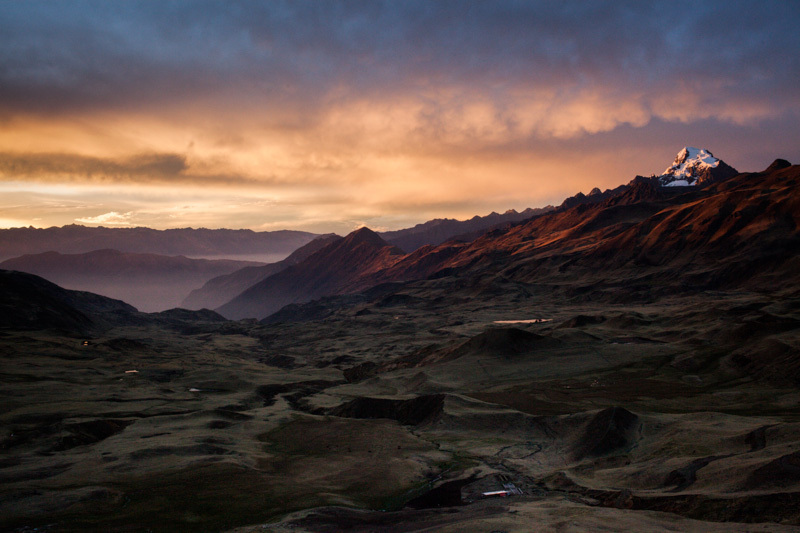 We’ll be arriving there in March/April 2014 at the end of the rainy season, so fingers crossed. Perfect timing! I’d highly recommend this route, as concocted by the Pikes on Bikes. They’re sure to have a gpx file and all the details you need. Pure magic – love the warm colours, the scenery, the composition! I think the colloquialism is BOOM – this shots are incredible Cass. Keep them coming! Dude, View from the tent! Great shot! Your photos are amazing….really like the view from the tent and the lady…keep shooting…your fans are waiting! I’m thoroughly enjoying your adventures and the photos, as usual. Looking forward to the next chapter! Thanks kindly for the comments. Should have good wifi in another week or so… Camera has been acting temperamental; fingers crossed it behaves! Awesome route and pictures! Did you bike to Churin and then Sayan too? I wonder if you think that continuing on that road is too risky for bike touring. How do you plan your trips? Thanks Jose. This part of the route was planned courtesy of the Pikes on Bikes! We didn’t ride via Churin and Sayan, as we have just been keeping to tiny mining roads. Check out their blog for more details. Hello! I’ve been to these places before on foot, backpacking. 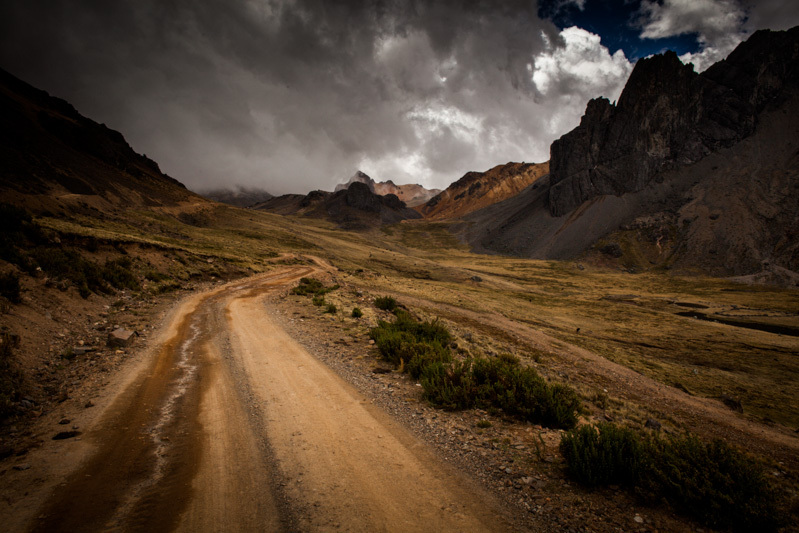 The road from Llacalla to Mangas had just been started. I remember eating avocados fresh off the tree Llacalla. 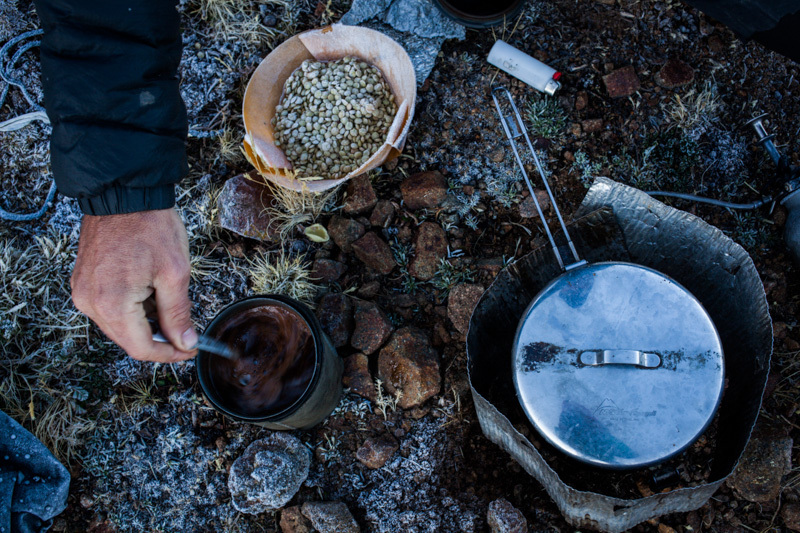 When we asked permission to pitch our tent near Mangas, the people told us stories of the last gringos they had seen there…10 years prior! I’m sure they got a kick out of. the gringos on bikes. Beautiful photos! Enjoy your trip nd pedal safely! Rachael, sounds like not much has changed! Mangas is still definitely off the Gringo Trail radar. Currently, there isn’t a road up from Llaclla, just a footpath to a town half way up the mountainside – Gorgollilo. 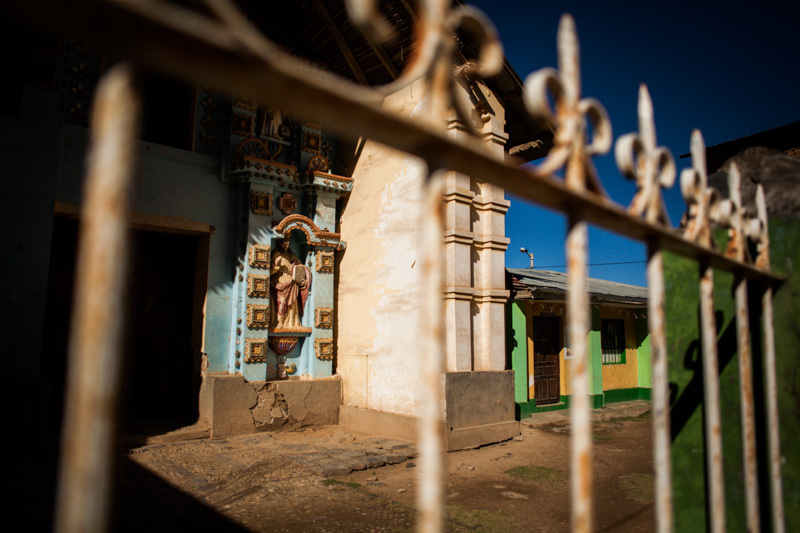 Once across the fancy bridge (that everyone seems very proud of), there’s two options to Mangas – inevitably, we chose the steeper, bumpier of the two dirt roads, camping in a pampa just below the village as night fell. Que tal amigo, que siga el viaje, espero su nota sobre la Reserva Paisajística Nor Yauyos Cochas. Muchas gracias para todo, Juan Carlos. Ahora, estamos en Laraos, con Clarita! Breath-taking pictures. Another of your many rides to add to my To-go-to list.